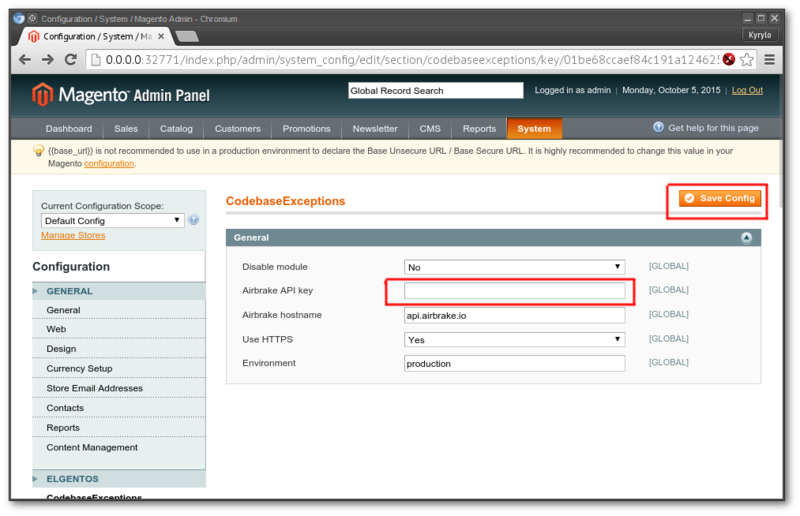 To configure Airbrake Magento, visit your admin panel (http://[YOURDOMAIN]/admin) and navigate to System → Configuration. On the left sidebar, find the ELGENTOS section and click on CodebaseExceptions. Copy and paste your PROJECT API KEY into the relevant field and save the new configuration. You can find your PROJECT API KEY in your project’s settings page. The configuration process is done. To make sure it works correctly, visit http://[YOURDOMAIN]/exceptions/index/test. This will trigger a new test exception. It can be found in your project’s dashboard. For more information please visit our official GitHub repo.